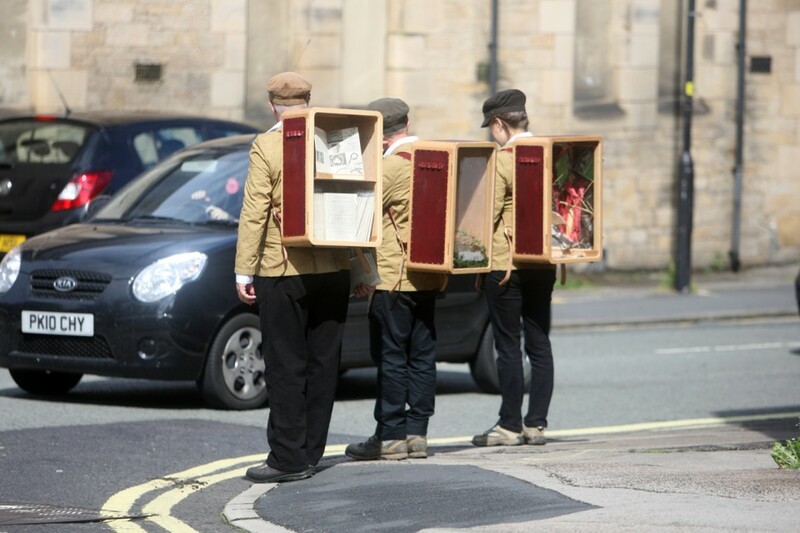 The performance works Ghost Bird and Signs & Wonders were commissioned by Green Close, with Live at LICA, for the highly successful Lancashire Witches 400 programme. For this exhibition the artists have reworked their beautiful and absorbing performances for a gallery setting. This process of reworking continues Live at LICA’s interest in artists working across disciplines and their desire for work to be experienced in different contexts. The work responds to the story and surroundings of the infamous Lancashire Witch Trials by examining the meanings we invest in objects and reacting to the evocative local landscape. Originally manifesting as performance walks and site specific live art installations, the reconfigured work creates new experiences, questions and exchanges. 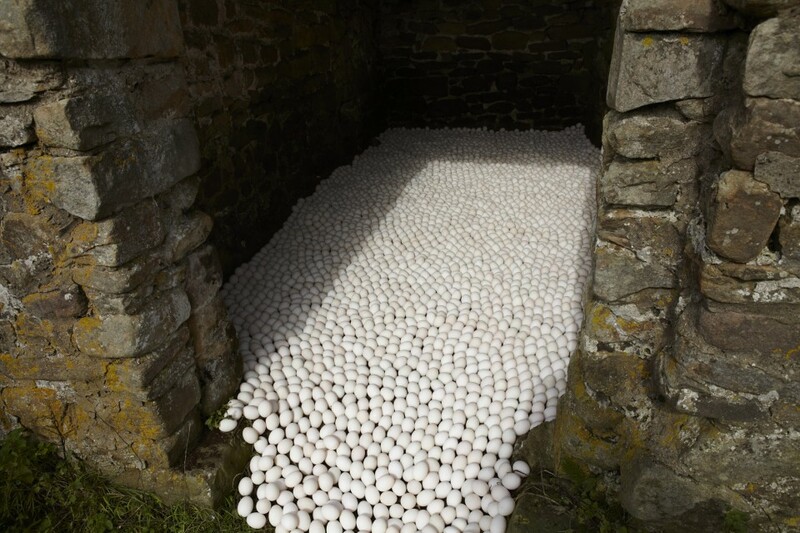 Ghost Bird (September 2012), was a silent walking-performance and live-art installation specific to the Langden Valley in the Trough of Bowland, an upland landscape internationally important for its heather moorland, blanket bog and rare birds. Referring to the ghostly grey feathers of the male hen harrier and the increasing absence, due to persecution, of nesting pairs in the Trough of Bowland, Ghost Bird celebrated the birds’ beauty whilst drawing attention to its sometimes fragile existence within the north of England. In doing so, the work became a means of reflecting on the journey taken 400 years earlier over the Bowland Fells to Lancaster Castle by the persecuted Pendle Witches. Signs & Wonders explores the transformation of objects and ideas, pointing to key locations and evidence associated with the Lancashire Witch Trials of 1612. 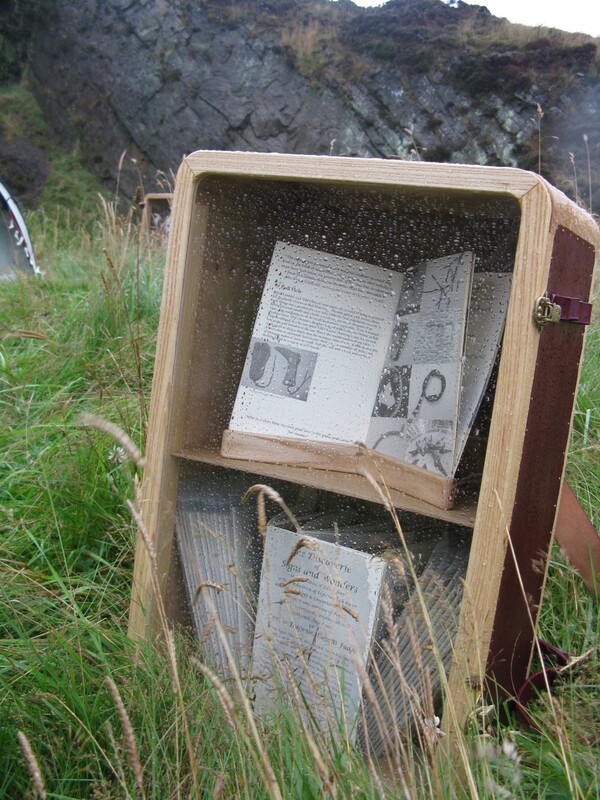 The work was originally manifested 16-19 August 2012 in a series of public walks, visitations, and live expositions in Lancaster and in Newchurch, a village at the foot of Pendle Hill. Using the notion of the pedlar as a carrier of multiple viewpoints, Katie Etheridge, Simon Persighetti & Phil Smith peddled ideas through trade, exchange and conversations. Along city streets, in the marketplace and down country tracks they distributed strange tokens and wondrous pamphlets. These specially commissioned artefacts: Future Archaeology by Helen Hockin, Portable Museums by Ian Reveley, and Discoverie Pamphlet designed by Tony Weaver are brought together with relics and records of the project, to ask the question; how do we invest belief and meaning in the objects and signs we make, use and come across in our daily lives? Signs & Wonders was originally co-commissioned by Green Close, Melling, with Live at LICA as part of Lancashire Witches 400 - a diverse creative programme initiated by Green Close exploring the heritage of the Lancashire Witches, the 400th anniversary of their trial and execution, and the enduring issue of persecution today. Simon Persighetti and Phil Smith are core members of Wrights & Sites. 7 October - 6 December 2013. Mon - Fri 11am-5pm & Sat 11am-4pm.